Exhibit Design Inspiration: Write On! We're kickin' it "old school" at ExhibiTricks today by highlighting one artist's creative "twist" on letter writing, and how that can serve as a bit of exhibit design inspiration for all of us. 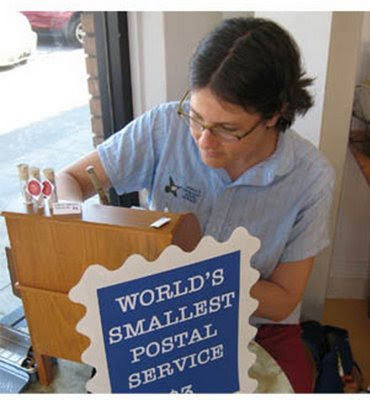 The "World's Smallest Postal Service" is a project started by Lea Redmond of Leafcutter Designs. Basically, you send Lea a short letter, and she transcribes it and miniaturizes it into a teeny-tiny letter and sends it along with a magnifying glass inside a larger glassine envelope to your specified recipient. Lea has taken a very familiar process --- letter writing --- and put a clever design twist on it, as well as embedding a sense of process into the final miniature missive. I love exhibits that give visitors a sense of process, rather than just the end product or final idea. Giving visitors a sense of how a particular artwork was produced, for example, would probably cut down on the "My kid could have made something better than that!" comments in art galleries by at least 50%. Also, there is a natural bit of whimsy in Lea's notion of the World's Smallest Postal Service, as you can see by the picture of her creating letters below. To me, that's the other takeaway for exhibit developers: loosen up! I know most of our work ends up in stodgy museums, but that doesn't mean we can't inject a bit of humor into our exhibits here and there. A great example of humor employed in what otherwise could have been a deadly dull topic, is Tim Hunkin's brilliant work in the "Secret Life of the Home" gallery at the Science Museum in London. On the surface a gallery filled with vacuum cleaners, door locks, and toilets sounds like a real snore, but Tim manages to actually get visitors to become interested in learning about these utilitarian items, and to have fun doing it! What are some of your favorite exhibits that show off process, or fun, or a bit of both? Share your thoughts in the "Comments" section below.